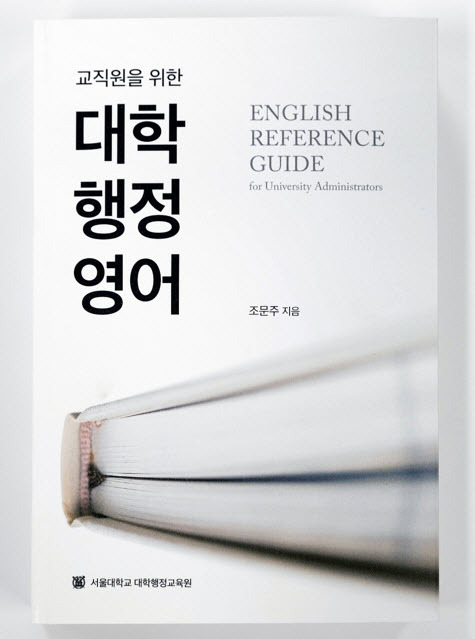 On May 10, the SNU Academy of University Administration announced that it has published English Reference Guide for University Administrators, a guide to assist Korean university staff in better operating in a global context. In order to meet the needs of the increasing number of international members of the SNU community, currently comprising more than 2,700 faculty and students, SNU has been providing various education programs for its administrative staff. This, along with the publication of English Reference Guide for University Administrators, is expected to greatly improve the administrative capacity of SNU’s mostly Korean staff to better accommodate its international members. English Reference Guide for University Administrators provides detailed explanations for English terms commonly used in the administrative process. “This will be useful to staff not only within SNU but also in other universities,” said Sung SamJae, director of the SNU Academy of University Administration. In her book, author Chloe Moonju Cho, member of the SNU Public Relations Team and currently in charge of the production of SNU English PR material (full disclosure: Cho also oversees the news reporting on this website), provides specialized information applicable to everyday administrative needs. Cho says of her book: “This is not the work of just one person, but the product of the combined efforts of experts in various fields.” She expressed hope that the book will help to improve communication between faculty and staff, not only at SNU but in universities across Korea.